来自 易兰规划设计院 对gooood的分享。更多关于他们：ECOLAND on gooood. 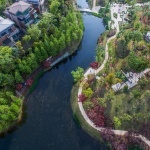 Luxelake Residential Community is located 25km south of the Chengdu city center in Sichuan Province. The 19-acre Redstone Garden is situated at a low elevation in the middle of a suburban community consisting of five large housing clusters. The region is developed, though lacked community spaces, natural settings, and play facilities. The client wanted a garden that would serve the diverse range of residents.Community feedback was collected, and the design intent was to create a large natural environment sensitive to the native ecology, and provide a range of curated spaces in which to socialize or unwind. The mandate was to create an open space, as a shared backyard garden, in a gated private community. Due to the low elevation of the area, it needed a comprehensive storm water management system. 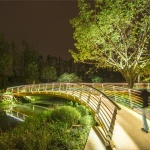 Form and function converged, creating a flowing waterway and an incorporated rain garden. Connecting people was a fundamental goal by creating a setting for the desired lifestyle and to preserve and represent the site’s unique, natural identity. Traditional aesthetics and native plantings were utilized to connect the garden to its cultural and ecological history. Inherent in the design is the cultivation of a very simple, yet sophisticated, indoor-outdoor living experience for the residents and their guests of all ages. The design programming intent was to create garden amenities for every age and lifestyle. There are provisions for active residents, including an exercise trail with fitness zones that loops around the outside of the garden, and a dynamic children’s play area that features a number of unique play spaces adjacent to a grand open lawn, which is available for community events and performances. For more tranquil activities, the garden offers locally-inspired bamboo pavilions within in a quiet bamboo forest overlooking rain-garden waterfalls. Intimate courtyards with custom Redstone tables and seating attract community elders to socialize and play cards or chess, while nearby barbecue facilities inspire family gatherings. Pedestrian entrances for each residential cluster are provided on all sides of the garden connecting to the outer loop with accessible ramps and walkways. 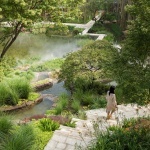 Bridges and paths are strategically placed within the interior of the garden to enrich the outdoor journey by linking every amenity of the garden for seamless way finding. Initial site visits revealed a large outcrop of indigenous red stone that geologically dates back approximately 250 million years. Inspired by the geologic features of the site, the easily carved, visually striking red sandstone, too soft for use in construction, is included in the walls, seating, and water features creating a common thread, underscoring the design motif throughout the site. Modernist bamboo pavilions nestled among the bamboo forest, and placed along the boardwalk surrounding the waterways, provide shade and shelter so the space may be enjoyed in all weather conditions. Located next to the ponds, the pavilions are drenched in mood lighting where reflections from the water illuminate the bamboo walls and roof. Here, the residents find a tranquil space to come together to play chess, drink tea, and socialize. 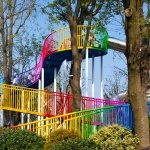 A rainbow color theme is applied to the children’s play area slide that weaves beautifully through tall trees, and to an education-focused ”kid-powered” irrigation waterwheel. 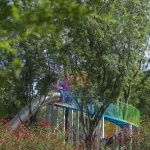 The rainbow colors can also be found on pedestrian bridges and reflect the rain theme of the garden. Rainwater management is a key element and focal point of the gardens. Rainwater runoff is directed by the natural elevation and flows into a series of retention ponds and detention areas connected by the mid-valley stream. 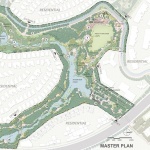 Designed cascading waterscapes and brooks all lead into a larger central lake whereby the water retention system now connects with the existing municipality storm run-off canal. Riparian edges are enhanced with selected plantings native plants and trees to jumpstart habitat complexity and species richness. 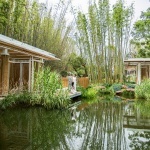 Within the Bamboo Forest a series of terraced pools allows rainwater collected from the street above to be filtered by aquatic plants as it passes from pool to pool before becoming part of the garden’s overall water feature system. Terraced waterfalls and ponds are not only an aesthetic choice but also function as intricate rain gardens for essential storm water management within the entirety of the garden, and measures are in place to insure water-flow in the ravine is not impeded in times of high rainfall. 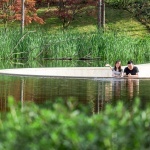 Bamboo is a revered species native to Chengdu and so it was crucial for it to play a significant role in the design. Most of the site’s existing bamboo on the west side was preserved in order to set the tone of the quieter part of the garden, and is now supported by generous plantings of native shrubs and ferns. Understories planted along slopes and visible edges provide erosion control and pleasing views for garden goers. Chengdu is a heavily urbanized city with hazardous levels of air pollution that often reach an AQI of 300. Bamboo helps filtering air, and within the bamboo forest there is a marked reduction in air pollutants. The bamboo also buffers sound and temperature, creating a clean, cool, and quiet environment – seldom found in Chengdu. 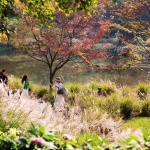 A large variety of native grasses, flowers, shrubs and trees are used in the garden. Aquatic plants are used in the terraced waterfall and along the brook to assist in filtering rainwater runoff from the surrounding streets. 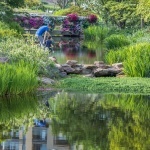 The aquatic plants also create an inviting habitat for frogs that help to mitigate the number of mosquitos in the summer months – an important aspect for the residents. 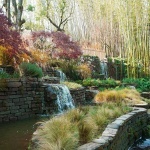 Planting pockets of native grasses and colorful accent trees soften and add interest to the cascading hillside. The native grasses, trees, and shrubs flower and change color with the seasons. 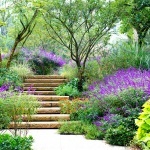 Rustic stairways through natural plantings of Salvia and ornamental grasses welcome residents into the garden. A slightly overgrown path means residents must brush past and touch the plants as they stroll by and discover the garden. Japanese Maple trees provide a punch of color in autumn with the red leaves accenting the red stone, tying the visual components together. Native wildflowers and grasses, mixed with epiphytes border the paths. A bevy of colors and textures foster meditative and mindful walks of discovery around the garden. 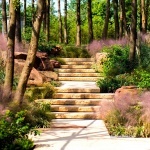 Overflowing plants disrupt the straight lines of pathways creating organic soft edges. 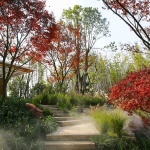 The terraced pools and waterfalls incorporate fountain misters to enhance naturally forming ground fog that shrouds the landscape in an ethereal mist. The naturally occurring fog among the bamboo caught the designer’s attention on initial site visits. Great care was taken to maintain and showcase this natural feature within the garden, giving rise to a spectacular and serene morning encounter. 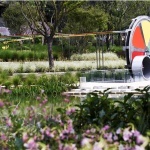 The rain garden pools surround the pavilions, producing a peaceful atmosphere. The cascading waterscape, blanketed in mist, creates an illusion reminiscent of an ancient Chinese painting. Further extending this theme, a traditional zigzag bridge traverses the lower pond adjacent to the cascading falls. 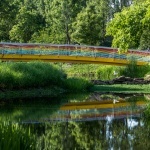 The bridge harkens back to a traditional design and ensures that elements of the local culture are incorporated into the garden. 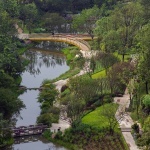 Redstone Garden is loved by the residents and has garnered so much attention that the local municipality renamed the nearby subway station ‘Redstone Garden Station.’ The garden has raised the value of residents’ homes and become a popular destination for them and visitors not only from Chengdu but from all around China. Visitors wishing to experience the garden may make an appointment with the community office in order to enjoy this unique space. 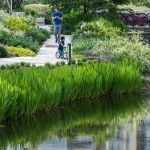 With a design that considers the combination of nature, culture, and people, the green infrastructure of Redstone Garden will serve the community, and even the city, for generations to come. More: ECOLAND 更多关于他们：ECOLAND on gooood.